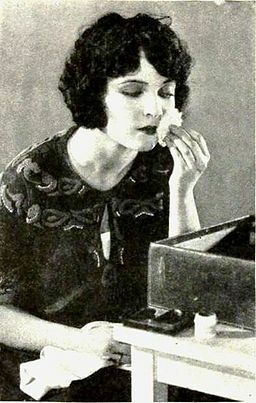 http://commons.wikimedia.org/wiki/ File:Jacqueline_Logan_-_Make-up_Instructions_3.jpg Image from Wikimedia Commons. The other day Luvvie Alex from Family Tree Frog suggested we tweak our blog this weekend. Geniaus also thinks it’s time for a mini-makeover. Don’t they know it’s not spring yet? So why are we spring-cleaning our blogs? At first it all seemed too anxiety-provoking but I’ve been tweaking away today. It’s a bit like going to the day spa…you feel so good you think it will be Elle Macpherson you see in the mirror, but nada, not so. Some months ago I removed all the old awards and many of the themes and memes images. I don’t need them – they show in my “memes and themes” category anyway. Kiva Genealogists for Families link – because it’s important! The Geneabloggers badge – go team! removed the tag cloud on this blog because it was cluttered but left it on my East Clare blog so people can easily see names and places. Resequenced the tabs on the pages menu (below the image). The main thing I’m ambivalent about is removing the break-down of categories. Will people even notice the option is there with the new drop-down box? What do you think? Generally I’m happy with my blog theme. I previewed quite a few WP templates and none suited my purposes as well. The images roll over randomly so it doesn’t get boring in that regard and I can always add more. In the past I’ve changed the background to cleaner, easier to read colours. The blog has lots of pages so since first posting this I’ve modified the resources to be a drop down menu. I’ve also managed to prioritise them differently so overall it looks less cluttered. And, yes, my blog links need to be updated…so if you think I’ve forgotten you by mistake, please send me a comment. Okay, deep breath! I’ll be brave and ask what you think of my mini-makeover? This entry was posted in Blogging and tagged blogging by cassmob. Bookmark the permalink. I like it! I also tweaked my blog a little but I wasn’t so brave as you Pauleen, I just changed to a simple theme. In case you didn’t notice I will point out that at the bottom of your page it says you can browse the categories on the right sidebar but I can’t see that anywhere. Thanks Kerryn. I think you may have made my concern come alive because it’s just a bar below the Fam Hist Mag image. Maybe I need to move it to a different spot, and change the wording below too. I really appreciate your feedback. Kerry, which blog should we look at the Wp or Blogger one? I remember looking at both for my recent task. Another typo – sorry Kerryn. A great task for NFHM and a makeover always makes you feel good. I need one too but mine will have to wait until spring and NFHM is over! On my phone now. Will take a look when I get home. The sidebar cleanup is also great – I had made a note that your sidebar was way too long. It looks like you have made your image header a bit shorter so that the title of your post shows up – a good move. I would prefer to see just the categories – they are broad headingsand if you need the subsets I would make them tags and put them somewhere else. You don’t really sidebar badges but that’s personal preference but I love yoour map widget – must go and find it for the geneadictionary. I’d love to see a thumbnail of that gorgeous photo from your about page somewhere on your front page or in the sidebar. I am using this same theme for my new blog and am finding it restrictive – wish I could find one that I can tweak to my heart’s content. Are you able to add hyperlinks to your other blogs that you mention in your footer? The footer info has a warm, friendly tone. Of course you always get gold stars for content. Thanks for being so brave and for allowing us to comment on your appearance. You’re looking pretty schmick. Thanks Jill. I agree the sidebar was getting too cluttered by far. The photo size hasn’t been changed at all so it’s probably just the menu change. I take your point about the font size – may change some but will probably leave Copyright as is. the photos roll over so each time you hit a page it will change. the hyperlinks to my other blogs are on the sidebar as blog roll so I was thinking of removing that footer entry. Forgot something – I think that a Subscribe by email widget is most useful for those who don’t want to bother with an RSS feed or following via the WordPress Reader. Quite a few of the people I come across in my sessions and who only follow a few blogs or who aren’t too tech savvy prefer to subscribe this way. If it was a choice of Follow or Subscribe by email Id opt for the subscribe by email. Jill, I think that if you’re not already a subscriber it lets you put in your email and receive the follow that way. Pauleen – thank you for being so brave and signing up for the blog feedback day. I think you know already that you were one of the first geneabloggers that I ever started to follow so you must be doing something right, huh? What do I like best about your blog? There’s so much but I have to say that for some reason I always think WordPress looks cleaner and has a nicer design…don’t know why but I just do. It’s a shame I can’t wean myself off Blogger! I have a blog on WordPress but am not as confident with navigating my way around as I am on Blogger. I really like that you have a rotating slide show now with the pictures. I think they are more dynamic and visually interesting now. I really like that you have linked to your other blogs. I think that is very smart and I may steal your idea 😉 What needs to be improved? I did not see that drop down menu on the Resources tab until I read your Blog Post closely. I just clicked on Resources and didn’t really find anything so thought that was a work in progress. Otherwise I think you have done a marvelous job and should be very proud. Thanks again for participating in this exercise. I see what you mean about the Resources tab as it’s a floating drop-down. Not sure if people paid much attention to them anyway…will see how it goes. Thanks for stirring us all up to give it a go. Alex, thanks to your comment on the Resources tab I’ve changed the content which appears if you click on it. See what you think and let me know if that works, please…your feedback would be helpful. I tweaked my other blogs a little but not much. I’d like to change the title of Blogroll to “My Blogs” but this WP theme won’t let me….but then I didn’t like any others as much as Twenty Eleven for my purposes. I admire your blog Pauline. It is uncluttered, easy to read and easy to find past posts. Normally I like a background theme photo but the plain background blends with your header photo and works really well. I think that you have done a great job. My only little suggestion is that the link under the photo is outside the photo box and not as neat as the rest of the blog? I think Alex and I must think alike. I can always spot a WordPress blog by the clean, sophisticated and slick look. However, also like Alex, I’m comfortable in Blogspot. So when I start tweaking my blog, I will try to achieve a WP look. Your color scheme is so soothing, especially with the banner photo. I also like your categories box and hope that Blogger has something like that so that I can eliminate my labels cloud. You expressed a dislike for the photo tag extending beyond the size of the photo — is that not something that can be edited? I had one like that and I just broke it into bite-size pieces. I see you are ambivalent about some of the changes, in particular whether visitors to your blog will be able to figure out how to navigate. Here is my ambivalence about that: for ME, instructions at the bottom of the page are just too late. I didn’t even know they were there until I read about it in someone’s comment. When I’m leaving a comment, it looks like I’m at the bottom of the page, but evidently I’m not. So I’m wondering if I EVER get to the bottom of other bloggers’ pages. I’m not even sure what’s at the bottom of MY blog page. Maybe I’m a poor visitor. For idiots like me, instructions at the top of the page would be more helpful. However, I understand that that could be distracting when there is so much else you want to emphasize. Thanks Wendy…I took your comments on board about the blurb at the bottom. How I got round it was to add a para into my “about me” page. Doesn’t quite fit there but better than being missed. I figure people will usually only read that page once then know what they’re doing with the blog after that. The photo tag was edited…just silly not to have thought of it sooner 🙂 Thanks for your helpful advice. See what you think about my updates. I like the theme you use. The only thing holding me back is that the headers are a different size than the 1 I’m using now and I would have to redo all of them. Pretty time consuming when I have taken the time to make them match the topic at hand. I think your theme is much cleaner. I may change yet. Thanks Kristin. I noticed again last night how fresh and clean your blog appearance is. Your photos are perfect for the topic so I definitely wouldn’t fiddle with that. The only thing I wonder about myself is whether archives options are useful…I think I’m more likely to click on categories. What theme do you use? if I had a choice I’d like my header to be narrower, a little….but I’m not going to die in a ditch over it. I looked at the others and decided I still liked this one…didn’t notice your though.